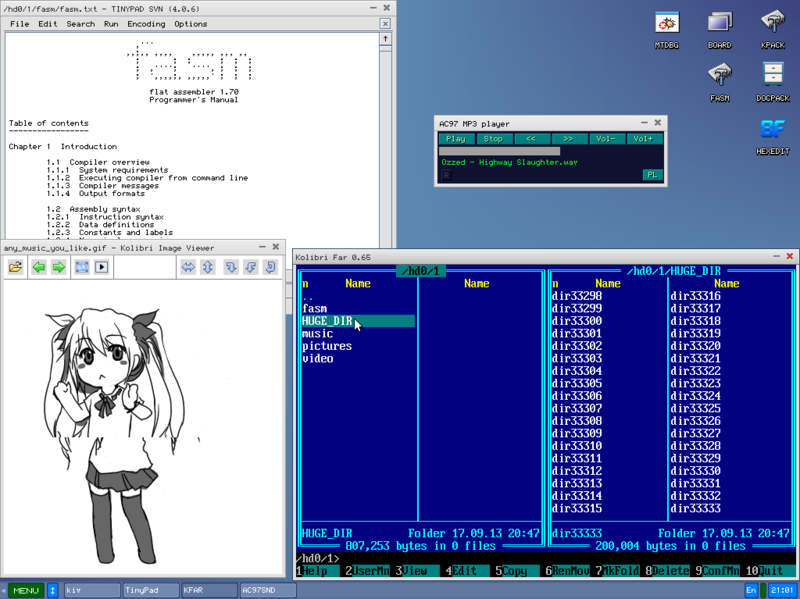 I started working on XFS read/write support as a KSoC student. Read support is in 'features are mostly implemented' state at the moment (one month is over). My current code, test kolibrios and hdd images and readme.txt (with more detailed description of how it is going) are located here. Feel free to aks me any related questions and report bugs. Passing -r option to xfs_db means 'read only'. You can run it safely on any (even mounted) device. If you can provide partition image, say, below 10GB (if you can, you know how to do it) -- that is the best option. Please, be precise while reporting bugs and patient anyway. Who is your mentor? Why he don't write his opinion here? What happened with Shikhin? Who is mentor? Why he don't write his opinion here? Formal mentor is XVilka but he isn't really involved. CleverMouse, Mario and Serge actually answered the questions. I suggest that dunkaist commits his code in our SVN, and if the code compiles and doesn't break any other existing functionality, for me it's enough to pay him for the 1st month. Shikhin's grandfather passed away, so I gave him a temporary "leave of absence". He should be back soon, I suppose. I think it's a good idea to commit the code to svn, at least read-only part. What is called 'writing' at the moment will damage fs for sure). But I'd like to fix some reading bugs first which are still here because I'm currently more concentrated on understanding writing logic and basic inode allocating process. It will definitely happen in one-two weeks and it seems to me logically to be paid when the code is committed. Thanks! To be honest, XFS image is quite outdated. I mean the current code handles more ondisk file/dir formats than that 02.xfs has. However, as I wrote above, there is still something to do before read support is complete. I will probably provide more sophisticated 0?.xfs though it is hard to fit a btree dir with over 100,000 entries into < 10M file. I think it is better to cancel payment to him and hire 1 or 2 students for another (easier) task(s) and shorter term. I have sent him a private message now, and offered to step off and allow us to take another student for another task. If he needs a few more days to mourn his grandfather's death, I completely understand that and have no problem to give him those days, but he should communicate it openly to all forum members, and not just disappear. Any idea on when do you plan to commit read support to SVN? I will commit/update_on_ftp all the stable/unstable code I have until the last deadline, since final report requires full code. Your first salary is long overdue because it's pending that commit. It seems ok to me because you know that feature is implemented (ftp) and I know that I'll get corresponding salary (same reason). Currently I'm trying to get some working configurations of write support. I wouldn't like my final report has words "many functions are written, but I steel need to write several ones before you can try/test anything". Here is my report for read only part of XFS support. you don't use new/exotic features like CRC protection of meta-data. My further aim for reading is to increase speed and stability (e.g. on fragmented files) and provide support for more custom flags/features. Current code is committed to repository. Test images are uploaded to ftp. Below is a screenshot of my code in action. Text file, wav track (seeking does work! ), dancing girl picture (she moves too fast, so gif animation looks like slideshow in qemu) and huge directory of 33333 entries (try browse it). And here is my report for writing part of XFS support. First of all, do not test kolibri_rw.img on real hardware! The code is on ftp right now, so you can still use nightbuilds safely. Unfortunately, writing is much harder to implement than reading. But though I didn't promise stable write support I don't consider its current state satisfactory. Uploaded test image (09.xfs.xz) contains several nested directories with files to delete them. The reasons (besides task complexity) are my laziness in August and studying at the university in September. I'd ask to move my final deadline to 17 October as to provide more adequate code and get positive reviews. Below is an image with KFM: both panels show the same directory before and after deletion of files/dirs (kolibri_rw.img, 09.xfs). The image where only read - everything works fine. And here in the form of test data record does not even open section. As asked by a General impression. If you will need the logs to you. Tested it in VirtualBox. The image where only read - everything works fine. Glad to read, thank you for testing. And here in the form of test data record does not even open section. As asked by a General impression. If you will need the logs to you. Tested it in VirtualBox. I use qemu 1.2.2 since there is very similar problem with current qemu 1.5.2. Please, try attach other hdd images with different file systems on them and specify VirtualBox version. I didn't really go into details with this problem, it doesn't seem to me to be XFS related. Tested on a real system. Reading works in both cases. The record is not working at all.